The key to understanding OPPD Substation Engineering manager Matt Eibes might lie in a childhood anecdote. Eibes’ father worked for Federal-Mogul, where his job meant solving electrical and mechanical problems for the Champion spark plug factory. 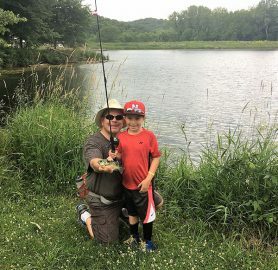 Eventually, son would follow in dad’s footsteps. Young Matt would watch his father, Larry, sitting at their kitchen table telling stories about his workday. Going over the problems he was working on at the factory and sketching possible solutions. Pretty soon, 9-year-old son was emulating dad. Eibes remembers sitting in the basement or in his bedroom “taking apart” the family’s digital alarm clocks to figure how they worked. Larry would walk him through various parts, showing him the electric components and explaining concepts like “resistivity” as they worked. It was at OPPD, where Eibes has now worked for 20 years, that those first seeds of curiosity have fully taken root. All those alarm clocks destroyed in the name of youthful intellectual curiosity turned out to be OPPD’s gain. Eibes came to OPPD as a summer co-op while attending Iowa State University and worked in the department now known as Protection and Automation Engineering. 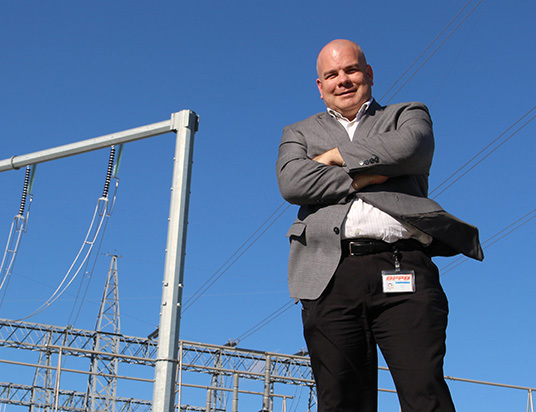 Now he works to make sure the utility’s substations are safe, resilient and reliable. Plus, Eibes is often involved in helping shape OPPD’s strategic directives. He also supports economic development efforts through substation facility siting projects. This summer, OPPD awarded Eibes with the Award of Excellence. It is the utility’s highest internal award, given each year to the employee best represents OPPD, voted upon by peers. 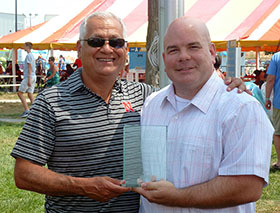 Mo Doghman, vice president of Energy Delivery, presents Eibes with OPPD’s Award of Excellence at the company picnic this year. Eibes’ days typically include meetings with team members, work on substation projects and time spent focusing on process improvements for his department and others across the utility. 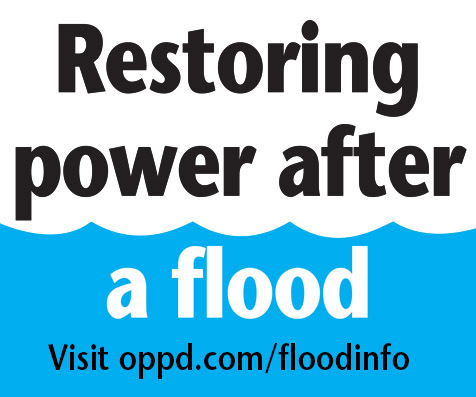 Eibes said his role supports OPPD’s residential customers, as well as business customers. One notable project that sticks out to Eibes was work done to support Facebook’s Papillion Data Center in Sarpy County. “I have three team members exploring 3D, which will create greater efficiencies and improve accuracy, along with a number of human performance and automation benefits,” he said. At home, Eibes stays busy with his family. 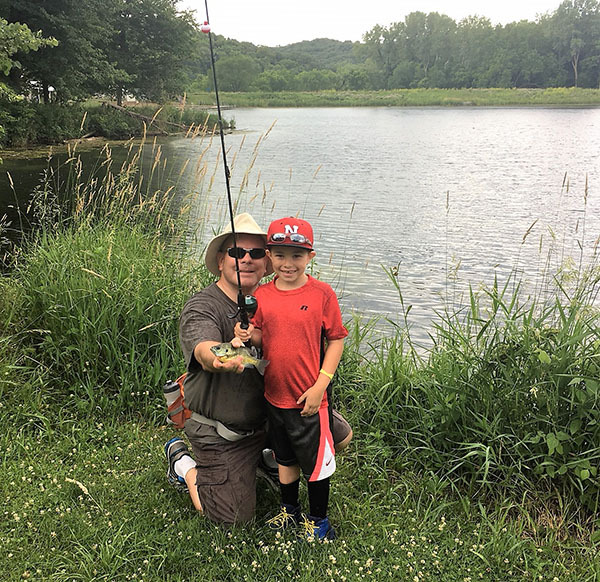 He and his wife are involved with their four kid’s full schedules of activities: club swimming, softball, baseball, football and Cub Scouts. Eibes is scout leader for his youngest son’s den, and the assistant scout leader for his other son. 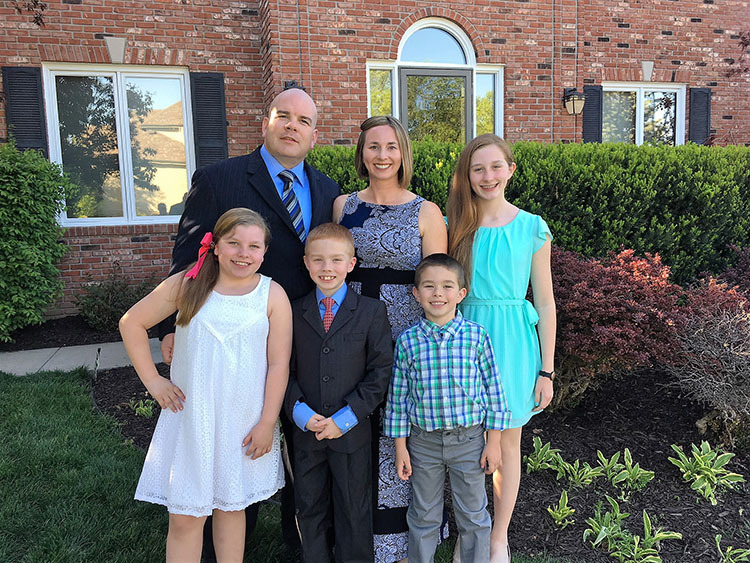 Matt Eibes with his family, back row from left, wife Alyssa, daughters Ella and Anna and sons Jacob and Joseph. So far, no alarm clocks have been taken apart at home, Eibes said. Not yet, anyway. But Legos are a big hit in the Eibes’ home, so you never know.